Partick Thistle may well be bottom of the SPL, but they are a leading example of LGBT+ inclusion. 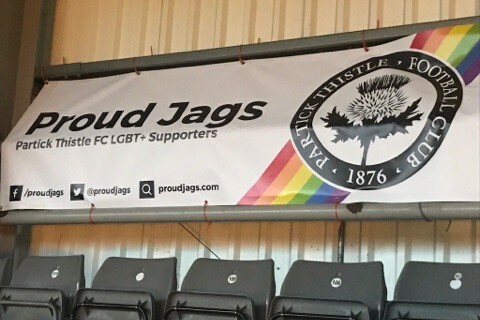 As they kick off against Hibernian, Partick Thistle LGBT+ fans group, ‘Proud Jags’, will officially launch at Firhill. In addition to existing Facebook and Twitter accounts, this weekend their webpage also goes live, encouraging fans and future fans to join the group. Stephen explained ‘Firhill doesn’t have a major problem with homophobia but there are sporadic outbursts that are homophobic’. The groups existence comes just months after a Hibs fan was banned over shouting homophobic slurs against Dundee FC players during the same game where Proud Dees unfurled their banner for the first time. Following a sperate incident, Dunfermline Athletic FC Chairman released a statement condemning the homophobic chanting of DAFC fans towards a Dundee United player. Such examples show the importance of dialogue between football fans and their clubs, and the importance of a decisive club response. We at LEAP first met Stephen when he attended Scottish Football Fans Activist Training as part of Football v Homophobia Scotland, co-delivered by LEAP and Pride in Football. Stephen called the training ‘the catalyst for driving forward the concept of Proud Jags.' LEAP are deeply proud to see a fans group develop from our training, whilst fully recognising the great deal of work the Proud Jags Founder undertook to get to this stage. There has been widespread movement of LGBT+ fans groups in England, Wales and wider Europe. We are beginning to see the start of a similar trend in Scotland, with Proud Jags joining Proud Dons, Proud Dees and Tynecastle Pride as the small but growing force of Scottish LGBT football fan groups. If you would like help and support in setting up an LGBT+ fans group, please get in touch at info@leapsports.org. Written on 2nd December 2017.